Make it easy, make it personal, make it salient. It's not rocket science, it's somewhere between common sense and psychology 101, and that goes a long way. 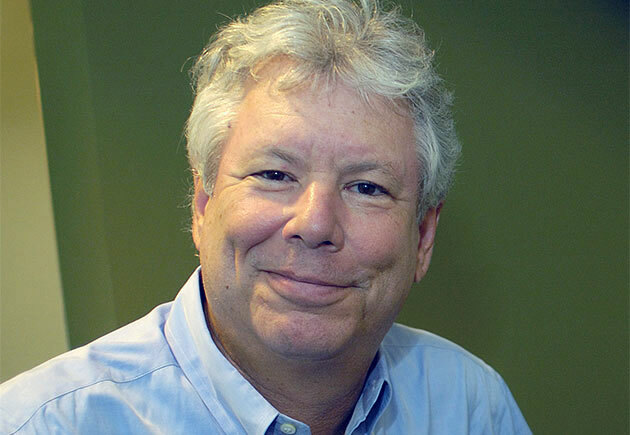 RICHARD H. THALER is the father of behavioral economics the study of how thinking and emotions affect individual economic decisions and the behavior of markets. Thaler is Director of the Center for Decision Research at the University of Chicago Graduate School of Business. He is coauthor (with Cass Sunstein) of Nudge: Improving Decisions About Health, Wealth, and Happiness. The idea I'm most excited about, and have been for the last few years, is an idea that doesn't sound exciting. It sounds boring, geeky, unimportant, technical, and I think it's the opposite of all of those things. It involves big data, it involves personal data, and I think it has the opportunity to change the way people shop, to create entire new industries, and to change the way the government regulates business. Here's the idea in a nutshell: let me give you two examples of, first of all, a way the government can generate jobs and businesses simply by releasing data. Example one: GPS. Now we all have our phones that tell us how to find things. That's how I found you in your hotel here from my hotel. We forget where does that come from. The government sent up satellites as part of the Defense Department initiative. Twenty years ago, in the Clinton Administration, they made the decision to make those data available to the public. Originally they added a little bit of error, but then they got rid of that. They provide that data for free and that's the way our cars tell us where to go, our phones tell us where to go. All the government had to do to generate this hundreds of billions of dollars a year industry was to take data they already owned and give it away to the marketplace, and then let the market work its magic. That's example one. Example two, somebody in the Bay Area gets the bright idea they know where all the buses and trains are. There's some control room in the basement of some building with lights beeping and things going around. They decide, why not put the data about where all the buses are, which have GPS locators on them, why don't we put that up in the Cloud? That costs nothing. They're just sharing the data that they're monitoring in real time. So they put it up in the Cloud. A few months later, somebody develops an app called Routesy and now you stand on a corner with your smartphone and it will tell you when the next bus is going to come. If it's broken down a mile away or there's some accident and it's never going to get there, you're going to know. That's true now in most major cities around the world. Again, it came from the government taking data they had, making it freely available and then the private sector figuring out how to do something with it. In the Obama Administration, the very first day of his administration, the president signed an executive order that said the policy of my government will be to release data wherever possible, and whenever possible, to do that in a machine-readable format. An example of what happens when you do that: There's a little company in San Diego that's called BrightScope. They rate 401(k) plans. You get a job offer from some company, you'd like to know how their 401(k) plan stacks up. You can look at their website. The way they had to get their data is every company files a form and sends it to the Labor Department each year with the details on their 401(k) plan. Previously, BrightScope had to go to Washington, go to some building in the Labor Department, file a Freedom of Information Act Request, and get a physical hard copy. They had to do this one by one for each company. Six months into the Obama Administration, they got a CD-ROM with every one of these forms for every company in the country. They hired 20 more people and they now rate every 401(k) plan for every company. Again, it cost the government essentially nothing to send them this CD-ROM. Now, here's an interesting side benefit of this: more than one board member of a Fortune 500 company has decided oh, let's go see how our 401(k) plan stacks up. They look at BrightScope, say, ooh, C minus, what's that about? They raise their hand at the next board meeting, hey, how come our 401(k) plan is getting a bad grade here? Somebody looks into it, and they fix it. There's an important lesson here that I'd like to stress. Which is, sometimes if you force firms to disclose things, they disclose things to themselves. So somebody in the company knew what was in that plan but they didn't really make it available to the people and the board. It took this roundabout process of the government releasing the data to some new private sector start-up who publishes it, and the board member reads it, and then he decides to do something about it. I want to expand this in all kinds of ways and change the way people shop, and change the way the government regulates various sectors. The key to doing this is to release two kinds of data in machine-readable format. One is prices and terms of service, and the other is usage. Price and terms of service: You apply for a credit card. You'll get 40 pages of fine print that no one has ever read. You apply for a mortgage; you get 100 pages of documents that neither the borrower nor the lenders read, to paraphrase Shakespeare. What would happen if all of those details were instead released in machine-readable format? New industries would emerge that I call 'choice engines.' Think of Expedia or Travelocity as a choice engine. Those choice engines have eliminated travel agents. We're now our own travel agents, and it's made it very easy. I want to find how to fly from Chicago to London; I can do it in five minutes. There are choice engines and then there are aggregator sites like Kayak that searches across the choice engines and finds you the best deal. What I would like to do is make every market at least as good as the market for airline tickets and hotel rooms and actually somewhat better because we can improve those markets where there's some fees like baggage fees and valet parking fees at a hotel. You book the hotel and you're driving in, and then you find out they're going to charge you $75 to park your car. We want all the terms to be available in a machine-readable format, which will allow the choice engine to make you into a smarter shopper. That's the first thing you need to be a smarter shopper. The second thing you need in some markets: suppose you're shopping for a calling plan for your smartphone. Somebody told me recently that in Britain there are 26 million different calling plans. You're supposed to pick the best one. Now, one of the things you need to know is what the prices are, what we've just been talking about. The other thing you need to know is how you use your smartphone. Do you know how much data you use, how many mega-somethings of data you use, how many text messages you send? Nobody knows that stuff. But you need the answers to those questions to be able to do a good job of picking a calling plan. In my dream world, a consumer would have access to both of these things. They would go to a choice engine, mycallingplan.com, and here's the way it would work: their current cell phone provider would send them a file or make access a file that has the data of all the ways they've used their phone and all the ways they can charge them for things. That price data would be available from all the other suppliers. Now just like I'd book an airline ticket, I'll go to this choice engine and the choice engine will do the work for me and say given the way you use your phone, you should probably be with this provider on that plan. We can do this for everything. Here in Britain, you have a choice of energy providers. It would be nice to know how you use your energy. It's difficult to get that information. So that's the idea in a nutshell. Two good things are going to happen out of this: one is we're going to make markets much more efficient. In traditional economics, markets are very efficient because consumers are very smart. Now, we know from the kind of work that Dan Kahneman and I have been doing for the last 30 years, that imagining that consumers are all as smart as Einstein and have CPUs that are as fast as Deep Blue is not a very good description of the world. Not only are we not capable of that processing, we don't have the right data. Let's give people the basis of making smart decisions. That's going to make markets more efficient. The second thing this will do is create all kinds of new industries, like the GPS that we were talking about before, like these apps that tell you when the buses are going to come. These choice engines will become a whole new sector of the economy. Thirdly, it has the capability of changing the way regulators operate. The regulators, we all know they end up playing this game, this we sometimes call 'rackamole'. Consumers will complain that banks are charging them $35 if they bounce a check, and that's outrageous. Some regulator comes in and says no, you can't charge that fee. The banks have to make money somehow, so they think of some other fee. This is an endless game that gets us nowhere. The government really should not be in the business of telling businesses which fees you can and cannot charge. They don't have to be in that business, if all the fees are transparent. It's only because fees are hidden. It's only when I arrive at the hotel and then they tell me they're going to charge me $75 to park my car for the night, that I get angry. If I knew in advance, I might not have rented a car. I might have taken a cab, or I might have parked the car at some garage or I might have picked some different hotel. We can take out the surprises. If we take out the surprises, the regulators have less to do. Something interesting is happening here in Britain. It turns out they have a law here that says that you, the consumer, have the right to your own usage data if a company you use is collecting those data. If you go to a supermarket that has a shopper's club and they're tracking all of your purchases, the law says you have a right to those data. Technically, exactly what the law says is you have a right to that data in an intelligible format. Whatever that means. What the retailers have decided that means is that if you send them 20 quid, they will send you 200 pages of fine print listing all the things you've bought, which is completely useless. We've been lobbying, and now there's an amendment to some bill, I'm not up on all the arcane language here about how they call things, but there's an amendment to a bill that will modify that sentence to say, instead of giving you a right to the data in an intelligible format, it will be giving you the right to that data in a machine-readable format. That will create all kinds of new opportunities for more apps. Suppose you have a kid with a peanut allergy and you can get all the data of the things you've been buying at your supermarket. You can go to nopeanuts.com and they'll look through everything you're buying and say cross these six things off. If you really want crackers, here is a cracker that's somewhat like the ones you're used to buying, but it doesn't have peanuts and it's made in a factory where they don't use any nuts. If you want to lose some weight, you go to loseweight.com and they'll say, here's the low-hanging fruit, if you just cut out the Oreos and the ice cream, you're going to start losing two pounds a month without a whole lot of pain. The opportunities here are endless. One interesting thing, though, that this will do, and something that I've been stressing in my conversation with ministers here in London this week is we're going to need new tool sets for regulators. In many branches of government, the regulators are lawyers. In the SEC, in the U.S., there's thousands of lawyers, about 20 or 30 economists, and no hackers. I think we need to start replacing lawyers with economists, and programmers and hackers because we need people who are capable of understanding data. Data is power. We can probably replace 1,000 lawyers with ten computer science majors from MIT and they'll do a better job and make markets more efficient, create all kinds of new jobs, and make consumers smarter and save them a lot of money. Let me tell you a story about how I came to this idea. I was doing some research on a book. We had a chapter on the prescription drug program in the U.S. called Medicare Part D. This program was complicated. There were 25 or 30 plans in each state, not the same plans in each state. When people enrolled, they had to pick an insurance plan. That was a complicated problem. There was a website that the government set up to help people pick the right plan but it was a complete nuisance to use. You had to type in every drug you were using, and drug names are like strings of random letters. There was no spellcheck, or there was no 'did you mean x? ', there were no pull-down menus. I had been hearing stories about how horrible this was. A friend of mine gave me the prescription list for her mother, and challenged me to go on this website and enroll her mother, hypothetically, into some plan, and see how much fun it would be. After two hours, I started drinking heavily and tearing my hair out and eventually gave up. I turned it over to one of my research assistants, a very bright young woman, and she could barely do it. Then it occurred to me, wait a minute: at least after the first year of this program, the government knows what drugs you're taking. If you're old enough, the drugs you're taking this year are a very good forecast of the drugs you're going to take next year. In fact, you're basically going to be taking the same drugs plus one, and we can probably even predict what that one will be. Why torture the consumer into entering all this data when we already know the data? My basic mantra when I'm working here in Britain with the so-called 'nudge unit,' my mantra when I go around talking to various government agencies, is: first principle, make it easy. This is an implementation of make it easy. There's a way we're doing this in the U.S. that's quite similar. Students that are applying to college in the U.S. will tell you that the hardest thing about getting admitted to college is filling out the student aid applications. You need three years of tax records from your parents, and often inconveniently the parents are divorced and they're not speaking to one another and have no desire to share their financial information with each other, and you're putting the poor kid between them. Who's giving you this loan? It's the government. What are the data they require? The data from the government, from the IRS. Brilliant idea somebody gets, let's prepopulate those forms. What does that mean, prepopulate? It means let's fill it out for you. This is either out there or about to be, in the U.S: when a student wants to fill out that form, all they'll have to do is plug in their parents' social security numbers (and there'll be some privacy protections) and then the application will be filled out for them. Making that happen will increase substantially the number of people that will continue past high school into some kind of higher education. If we're talking about how are we going to reduce income inequality, how are we going to reduce unemployment, the first thing we have to do is increase the skill level at the bottom rung, and one way is to get people to take on some education past high school. They need some student loans to do that, so make it easy. That's the underlying principle here, is use modern technology to make it as easy as possible for people to go on with their lives. The Smart Disclosure Initiative is very much happening in the U.S. I'll give you a story. We had a conference at the White House on Smart Disclosure, which is what the Obama Administration is calling this big initiative of giving people access to their data. We had three or 400 people from various branches of government who signed up to come to this conference to learn about this idea. I always find that it's a good idea to give people a real practical lesson about what you're doing, before you start getting into abstractions. Two days before the conference, we sent everyone who had registered for the conference an email. We said, the conference is over-subscribed, which is true, which gives you some sense this is a topic of great interest all around Washington, so please confirm that you're coming, and by the way we have ordered lunch for everyone. The default option for your lunch is a healthy lunch. Then we give a description of this healthy lunch, and it's not a lunch that anyone who's not a health nut would want to eat. I mean, it was basically tasteless tofu on dry indigestible crackers. We made the description as unattractive as possible and we said this is the default lunch, but if you would like to select something else, click here. Eighty percent of the people took the default lunch. Then there were two pages more of this letter, and when you got to the bottom, it said 'well, if you've reached this point of the letter, you're eligible for a prize; if you want to register for the prize, click here.' One percent clicked. The point is that the usual kinds of disclosure are useless because even people who are in the business of disclosure don't read disclosures. The funny thing is that for the rest of the morning (I was the first speaker) and for the rest of the morning people were wondering whether there was a sandwich shop nearby that they might be able to get a decent lunch, because they didn't realize that we were kidding, and we were actually going to feed them something edible. As you know, my work was greatly influenced by the late Amos Tversky and Danny Kahneman. I had the great privilege of spending a year with them, 35 years ago; 1977/78. I was a young assistant professor; obviously I must have been about 12 at the time. I got wind that they were going to be spending a year at Stanford. They were at Hebrew University in Jerusalem at the time. I had recently discovered them. In fact, I think my greatest discovery as a scientist was discovering Daniel Kahneman and Amos Tversky. Other people thought they had existed before my discovery, but no economists really had ever heard of them. For an economist, this counted like a discovery, sort of like Columbus discovering America. It was already there. I had read some of their stuff, and decided that I had to make it my business to get out to Stanford that year and hang out with them. They knew almost nothing about economics, and I knew almost nothing about psychology. We made friends and started teaching each other the other's discipline. There's a famous picture of Danny from that period, and on a bookshelf behind him there's a copy of Samuelson's Principles of Economics book, a famous freshman economics book. That was the level of economics that Danny was learning. One of the stories from that year: they were in the process of polishing their masterpiece prospect theory, a paper that eventually won Danny the Nobel Prize that he would have shared with Amos had Amos not tragically died at 59 in 1996. I would often wander up the hill. I had an office at the National Bureau of Economic Research, and Danny was at the Center for Advanced Study, and was just a little further up the hill. I would walk up the hill to talk to Danny, and would often run into the two of them. This was pre-computer, so they were writing things out in longhand, and they would be working on this paper, and they would argue over every sentence. The writing process was: argue about every sentence, and argue about every word of every sentence. Many years later I had the interesting experience of reproducing that with Amos. I was living in Cambridge at the time, Cambridge, Massachusetts. I was visiting at MIT and Amos had been giving talks there, and then was going off somewhere else on a Monday and had a spare weekend. It happened to be the second week of the NCAA Basketball Tournament, and Amos was a big basketball fan. We decided to spend the weekend. There was the paper that we needed to write, and we decided to spend the weekend watching basketball and writing this paper. My wife, France, got wind of this, said hello to Amos, got in her car and drove up to Montreal (which is where she is from) because she didn't like the sounds of this weekend. It was one of the best weekends of my life. What we did was we started writing this paper. We would write one page, and then we would watch the end of a basketball game, and then we would go back to the paper, and we would go back to word one, and we would read everything. We had only written a page so we would read that page and modify it, and after some time resume, write another page, watch the end of another basketball game, and then go back and start again at the beginning. We watched the end of eight basketball games that weekend and wrote eight pages. Even at the end when we were working on page eight, we would start at the beginning. Amos was a perfectionist in every possible way, and this was just the way we would do it. It was slightly infuriating. We've edited that first page now seven times, don't you think we could move on to page two when we start? But this was going to be the way that we did it. And they're not the best eight pages that either of us ever wrote, but it was I think one of the best weekends of my life. I've been coming over to London for the last few years. It all started, I came over here to teach for a couple weeks. The University of Chicago Business School has an executive MBA program here at London; the faculty fly over to teach for a week. I was supposed to come here to teach. I was here in London, and met a young man who was in his mid-20s and who was working for the Conservative Party (who were out of office at the time). He had recently read a copy of a book I had written, and was enthusiastic about it and said, "You've got to come over and talk to us about this." I get this call from him on my cell phone, and I'm a tourist, I'm wondering around London in jeans and a t-shirt, and he says, "You've got to come over to Parliament and talk to us." I said, "Well, I'm not really dressed appropriately for that." He said, "Don't worry, don't worry." Boy, was he right not to worry. This guy's name was Rowan. The guy who was the leader of this group of advisors is a guy called Steve Hilton, who I subsequently realized wore LA Lakers shorts in his office in 10 Downing Street when they later took over the government. So I needn't have worried, wearing jeans was dressing up for this crowd. We had an interesting hour talking about how you might apply the principles of behavioral science and behavioral economics into more informed public policy. I didn't think much of it after that. But when I was in London I would check in with them. A couple years later they got elected, and much to my surprise and delight, decided to create the World's first council of behavioral science advisors, much like our council of economic advisors in the US. They called it the "Behavioral Insight Team", though the media insisted on calling it the "Nudge Unit". Once that thing got started, I agreed to be informal advisor to them, unpaid advisor. When I'm in London I come and spend a couple days with them. It's very interesting. We typically line up a bunch of meetings. This team, I should say, it's led by a very good social psychologist called "David Halpern" who used to teach at Cambridge, and worked for Tony Blair, and he's the head of this unit, and six civil servants. That's all there are: there are seven people. It's a budget of less than a million dollars a year. We go and we'll talk to some minister, and a couple people from that minister's staff, and we'll say, "Okay, what's your problem? What problem do you have that you'd like to work on?" Then we tried to think of some science that might be put to use to work on this problem. The problems can be almost anything. One of the early success stories is we met with a guy whose job it is to collect from people who owe money on their taxes. Now, in Britain, its called "Pay as you earn", and there are no deductions. They basically just take their share out of your paycheck and tax returns are normally not a big deal. But as in the US, if you have outside income, you write a book, or you give a lecture or something, so you have income that's not subject to withholding, then it's up to you to send them a check and those people don't always pay on time, and so this guy's job is to collect from them. So we said, "tell us what you do." "We send them a letter." "What does the letter say?" They showed us the letter. They had actually been working with a psychologist already, and we said, "Okay, let's try to improve that letter and let's run an experiment." I have two mantras I repeat in every one of these meetings, and people start laughing. They call them "Thaler's mantras". One is "Make it easy", and the other is "We can't do evidence-based policy without evidence." When we try something, we insist on running a randomized-controlled trial to see what works because to do anything else is completely arrogant. But that's the way policy is done almost everywhere, and not just in government, also in business. The new guy comes in, and he says, "We're not going to do it this way, we're going to do it that way, because I know best", and we do it, and nobody bothers to figure out whether it's working better or worse. For two years now we've been sending out letters to people who are behind on their taxes, and various versions of these letters to see which are most effective. It turns out the not very big secret, using some lessons from Bob Cialdini, the great social psychologist, who wrote the book, Influence: First of all, use social norms. Tell people truthfully that "most people pay their taxes on time, and we're sure you would like to be paying them. Perhaps this an oversight, here's what you owe, here's an easy way to pay. You can go online and just pay it off." That raises it up a little bit. Then it turns out, and this is another Bob Cialdini trick, if you say 87 percent of the taxpayers in Exeter pay their bills on time, that increases the yield even more. If you mention that 87 percent of the people in Exeter pay their taxes on time, and it helps pay for that new clinic in your zip code or whatever they call them here, that's even further. To make a long story short, the best letter has a yield of about 10 percent higher than the original letter. This has brought millions of pounds of revenue into the treasury, and it essentially costs nothing. It's just changing the words in a letter you were already sending out. It's crazy not to do this. So having that early success I think has given the team some credibility around Whitehall, and now other ministers are interested in figuring out ways they can apply some of the basic principles of behavioral science to improve what they do. There are two aspects of getting this right. Part of it is to collect the data and see what works, but you don't want to just try stuff at random. If you use I call it "Psych 101" but if you use well-established principles like loss aversion, I call it "Make it easy", psychologists call it "Channel factors", but it's the same. There are some things that we know from psychology and behavioral science that are very robust. Anchoring is another one that Danny Kahneman talked about in his recent book. There are principles that are going to work 95 percent of the time. We have a pretty good idea of what's going to work. But you don't want to get arrogant so even if I'm pretty sure it's going to work, I'm not sure that I've got exactly the best way to do it. So we test. This is, of course, randomized trials, not a new idea. It's commonplace in science, and in medical research. It's completely unheard of in government and almost unheard of in business. The strategy is whoever is in charge knows what's right to do and doesn't have to run some experiments. Here's an interesting thing: that attention comes in every time we run an experiment. As soon as some preliminary results come in, somebody will want to stop the experiment. Why should we be sending these control letters? Let's just send everybody the best letter. You have to fight that off every single time you run an experiment. You have to say, "Look, we have to keep running the control condition because otherwise we're not going to learn anything." In the long-term we're going to get payoffs from running the full studies. I found that to be even harder in the private sector where there's money on the line, and you get people interested in running an experiment, but as soon as they sniff out that there seems to be one version of this that's more profitable, they're very anxious to stop running the experiment and start making the money. The domain in which behavioral economics has had its biggest influence is in the area of pensions, and it's kind of a natural for us because saving is difficult, and it requires self-control. Traditional economics doesn't think self-control is a problem. People do what they should do. There are no fat people in economic models. In economic models no one has a hangover. People just do what they should do, and that's that. They save just the right amount for retirement. Unfortunately in the US they were saving negative amounts for an entire decade, and that's not the right amount. We've been studying how to improve retirement saving, and there are essentially two tricks. The first is, again, make it easy. Firms in the US started experimenting with what's called automatic enrollment. And the idea is pretty simple, under the old regime you're now eligible for the 401K plan, you get a pile of forms to fill out, you have to decide how much to save and which funds to pick, and the more funds there are, there more overwhelming this is, and many people throw up their hands, just don't do it. Under automatic enrollment you get that same pile of forms, but the top page says if you don't fill out these forms, we're going to enroll you at this saving level in these investments. Hardly anyone opts out, so that's a good thing, and gets people enrolled very quickly, but the downside is that firms pick a pretty low saving rate at 3 percent, and people will passively accept that, even though it's not enough to fund retirement. The second step was to incorporate an idea that Shlomo Benartzi and I came up with that's called "Save more tomorrow", and the idea of "Save more tomorrow" is that you invite people to start saving later because we all have more self-control later. Many of us are planning diets next month, and we're planning to write books next month. I'm going to really get serious about that book next month. If you ask people, "Do you think you should be saving more", they say yes. "Do you want to start saving more right now?" "No. I can't afford it." "So how about later?" "Oh, yeah, later I would do it." So save more tomorrow. The second thing was loss aversion. If you say, "Why can't you save?" "Well, I can't afford it. I'm living day to day." We say, "Okay, can you save more when you get your next raise?" Now we just take a little of the raise so their pay doesn't go down, it just doesn't go up by as much. That makes it all palatable. Save more tomorrow now is available in thousands of firms in the US, and it's starting to have a noticeable effect on the US savings rate. Now the US saving rate is 3 percent, maybe 10 or 15 basis points of that is because of "Save more tomorrow". It's starting to have an effect. In Britain, they just recently launched kind of a national 401K plan, and it includes automatic enrollment. This has been in the works for I think seven years. It's finally just kicking in now, but it does incorporate these ideas, and I think much more likely to be success as a result. They don't have "Save more tomorrow" incorporated in it yet.